You decide a vacation with your family and accordingly plan an itinerary for the same. What follows next? The process includes - time of departure-arrival-lodging-food-sightseeing-time of departure again. Every situation has its own status, process and a defined step ahead. The same procedure applies to businesses. Across various industry verticals, there is always a need for strategy driven business processes. Imagine, scores of monetary decisions are taking place based on massive customer database on a daily basis.Decisions related to funds, loan approvals and many more are regular phenomena. This is where business flows come into the picture. While offering a complete streamlined user experience, flows help in automating processes. Flows lead people through enterprise defined processes that guide people in getting their work done based on their access roles and reach a desired outcome. In addition, flows help in informing a user where he/she is in the entire process. Flows are effective in optimizing time and money investment. It does so with the help of ‘defined process’. Take the example of Dabbawalas in Mumbai. How do they efficiently deliver more than 200000 tiffins with an error rate of one mistake? They follow Six Sigma, that is highly proven and defined methodology for eradicating defects. the more your process is defined and devoid of defects, the more it is efficient, quick and cost effective. Business flows are successful products of well researched strategies. In different and dynamic business scenarios, flows are used in supporting sales methodology, human resource set up in enterprises etc. It gives independence to the user to configure them as per the process and lead towards guided journeys and decisions. With flows, you can define stages and steps which are then put in place for efficient decision making. "When business flows are integrated with customization and configurations, they help in saving users’ time, increasing user adoption, better decision making and decreasing training costs." How does the ‘flow’ flow? When you create a business flow, you are actually configuring stages that have steps and each step represents a particular field where data is entered. Depending upon the requirement of each step, you can enter data to the corresponding field for proceeding to another stage. Using flows will make designing even routine and dull business activities more exciting. Any business, no matter large or small, aims to establish rapport with the customer base and further enhance it. With an effective implementation of business flows, operations are more efficient. This helps to reduce cost by as much as 30%. 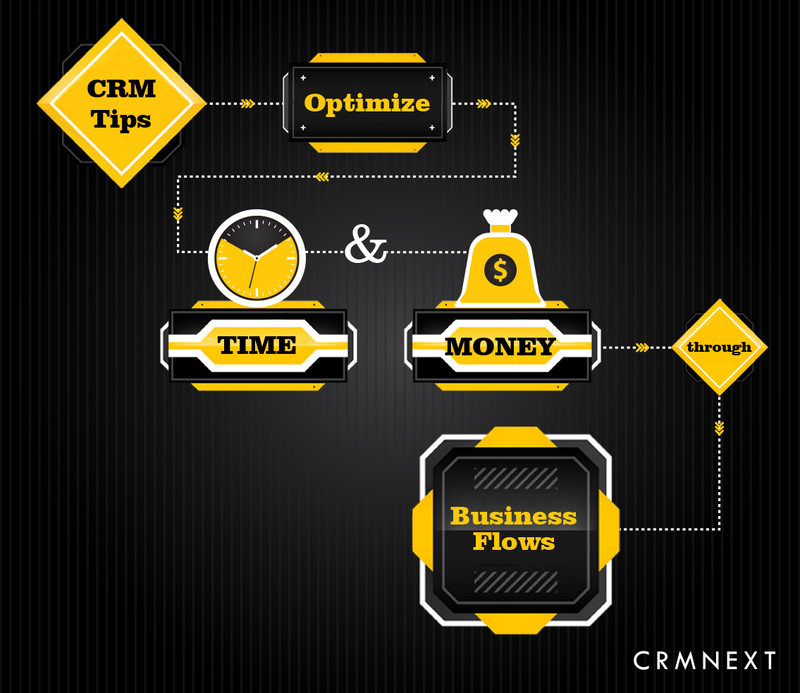 CRMNEXT workflows are designed and configured to fit in various business specifications by optimizing and improving the processes. You don’t have to spend huge resources in terms of effort, cost and time to code for every integration and logic. As you can see, business flows assist in efficient, strategic and quick decision making. They are integrated with elements like swim lanes, connectors, Xor and others to help create journeys. With laser focus on time and investment costs, business flows capture the right data and let go the ones that do not meet the criteria. Let your business, with the help of CRM Solutions, become the toast of the markets with zero coding, minimal clicks and faster process turnaround time. Debashri Gupta is a member of Product & Activation Group and writes about cutting edge CRM technologies that goes into building the World's #1 Commutable Cloud CRM Solutions, CRMNEXT.